UVic Scuba had an amazing three days of scuba diving with Hornby Island from February 19-21, 2013. 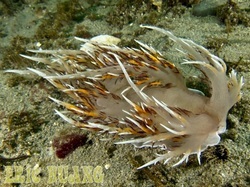 There were tons of underwater marine life, such as anemones, rockfish, jellies, sponges, nudibranchs, crabs, and so forth. Hornby Island has similar types of scuba diving wildlife as around Victoria, just much larger and in much greater concentrations, as you can tell by the images! However, the highlight of the scuba diving trip was our two Stellar sea lion dives. Stellar sea lions average from 600-1200lbs (and can get over 2000lbs). Sounds intimidating, but scuba diving with the sea lions is like scuba diving with oversized puppies. There were hundreds of sea lions hanging around on the rocks on the surface, and around 40 in the water with us for each sea lion dive. And they weren't intimated by Frank's good looks either. They were curious and confident. The sea lions constantly nipped at us playfully while we were scuba diving, but it was totally worth the scratches and bruises for this amazing scuba diving experience. Thanks to Hornby Island Diving for the excellent scuba diving. Thanks to UVic Scuba for organizing a great scuba diving trip. And thanks to the scuba divers that joined in the fantastic scuba diving. 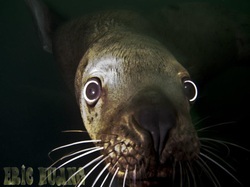 Sea Lion Video (Hornby Island - Feb 19-21, 2013) from Eric H on Vimeo.